CaribPR Wire, NEW YORK, NY, Weds. Sept 7, 2016: Caribbean leaders need to throw out the old play book, and think big – beyond the status quo. Delivering keynote remarks at the TCI event on the topic ‘Dimensions of Competitiveness in the 21st Century: A Global Perspective,’ Persaud said that the Caribbean region is being left behind while other developing regions are soaring ahead because the problems and challenges are being addressed with the same standard solutions. 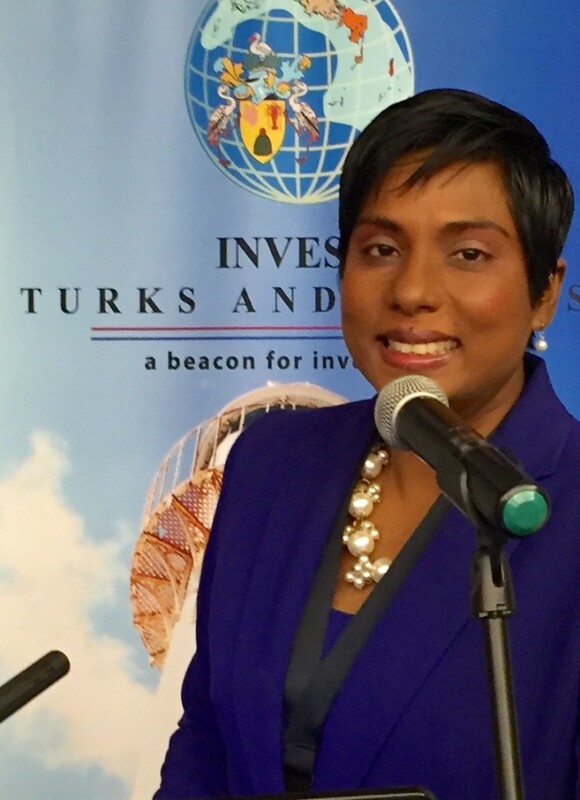 The ICN CEO recommended five keys which she said the region and the Turks & Caicos should be applying in this 21st century to overcome serious growth challenges in the post-Brexit era in which the Caribbean and TCI now finds itself. The legal marijuana market in the US is predicted to rise from US 6 point seven billion dollars this year to US 21 point 8 billion by 2020 and some countries like the Netherlands have begun to export medical marijuana to countries like Canada, Italy, Germany and the Czech Republic,” said Persaud. The day-long event also featured Anya Williams, Deputy Governor of the Islands; Washington Misick, Minister of Finance, Investment & Trade of the TCI; Mark Durliat, CEO Grace Bay Resorts and John Williams, Director General, Telecommunications Commission Turks and Caicos Islands. Invest Caribbean Now was launched five years ago in collaboration at the time with the Caribbean Tourism Organization to serve as a conduit between funders and governments and private sector developers in the tourism field. It began with an annual investment forum that featured investment bankers, private equity investors, ministers of governments, hotel developers, tourism officials, architects, real estate developers, financial advisers, entrepreneurs, Chinese government officials and investors as well as the media in a giant match making event that put the spotlight on investment opportunities in several Caribbean nations including Bermuda, the Turks & Caicos Islands, St. Martin and Trinidad & Tobago. Based on its effectiveness in bringing people together to do business and its network of high net worth lenders and programs, ICN, owned by Hard Beat Communications, expanded it focus in 2015 to become the private sector investment agency of the Caribbean, focusing now year round on matching projects with funders and funding. Construction projects like resort and hotel construction, villa and mixed use developments and multi-family properties are welcome as well as major infrastructure development, energy and mining projects. Additionally, debt funding is available for refinancing, purchase or bridge loans of between USD$1 to $100 million. Meanwhile, small to medium-sized Caribbean American and Hispanic-owned businesses in the U.S. and Canada who have been in existence for one year and have earnings of USD100, 000 can also contact ICN for access to SBE loans of up to USD250, 000 for expansion. For more information see investcaribbeannow.com.